Your frustration with home maintenance, repairs and seasonal chores ends now. WORKS by Jesse DeBenedictis, the people you trust with your new build or remodel, offers professional, individualized Property Management in Marblehead, Beverly, Salem, Ipswich, Essex, Rockport, Gloucester, Manchester-by-the-Sea and other towns on Boston’s North Shore. We begin by thoroughly assessing your primary or second home, outside and in. At a one-hour consultation with you, we share our findings and learn your own goals and objectives. Together we establish priorities and the services that WORKS will deliver for one cost-effective annual fee. We set up a schedule for chores, maintenance and repairs to suit your lifestyle. We tackle small problems before they become expensive projects. We bring in dependable, professional contractors, when needed. We keep you informed through regular meetings and online reports. At every stage in your home’s life, WORKS makes sure it is running smoothly and ready to give you years of comfort. Homes on the North Shore of Boston are close to the ocean; range from 50 to nearly 200 years old; fight exposure to wind, rain, snow, and ice; nestle in aging groves of trees; and are beautiful parts of our common heritage that should be kept whole for future generations. WORKS by Jesse DeBenedictis, the people you trust with your new build or renovation, offers professional, individualized Property Management & Repair. 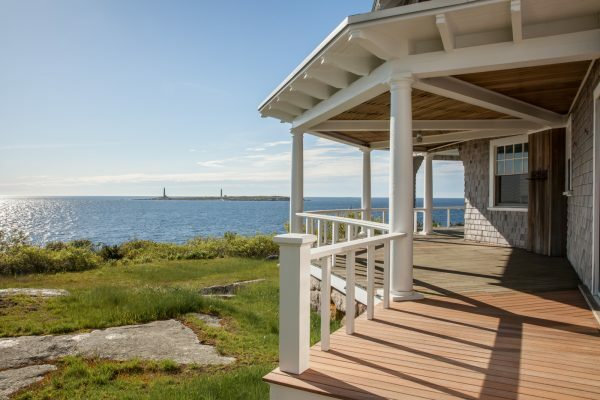 Professional Property Management & Repairs Preserve 100-Year-Old HomeFor the homeowners of a 1912, five-bedroom summer home on the ocean in Rockport, it means that WORKS comes by two times a year to check on their property. The outside trim, roof, and chimney are undamaged, especially after a harsh winter. No trees have grown over the house in a threatening way or rotted out. Roof vents are removed before the family arrives in the summer. Roof vents and storm windows are replaced every fall. Exterior paint is touched up as needed. The homeowners are alerted about any new maintenance projects. We have also handled larger repairs and renovations at the homeowner’s request. Among other projects, we have replaced and re-stained interior floors, added a shower, renovated a bathroom, and rebuilt the porch balusters, railings, and trim to match the historic original. In the twelve years we have been checking on their home, the homeowners have developed a respect for our keen eye, our knowledge and skills, and our appreciation of the unique features of their home. They know that we will handle any problem or project correctly and thoroughly: the problem is solved and the project is completed expertly, on time, and in budget. Let us assess your primary or second home, outside and in. At a one-hour consultation with you, we will share our findings and learn your own goals and objectives. Together we’ll establish priorities and the services that WORKS will deliver for one cost-effective annual fee. We use the most modern and efficient tools and processes. We bring in dependable, professional contractors when needed. Preparing your North Shore home for the winter, readying it for the summer, and keeping an eye on it in between is difficult and time consuming. At every stage in your home’s life, WORKS makes sure it is running smoothly and ready to give you years of comfort. Contact us today to find out more about our individualized Property Management and put your home in the hands of the professionals you trust.